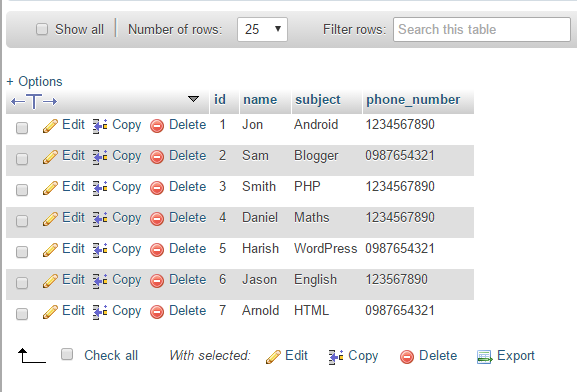 How to fetch PHP MySQL student records from server and display inside Custom RecyclerView including CardView. In this tutorial we would going to create a complete server integrated student data management RecyclerView. This RecyclerView is build using multiple JSON parsing data straight incoming from online server. We would convert the MySQL database records into JSON form using PHP script and parse that JSON into our application. After done all work we would also show the RecyclerView clicked values and print student name on screen using Toast message. You could print any thing from that record as your own requirement. 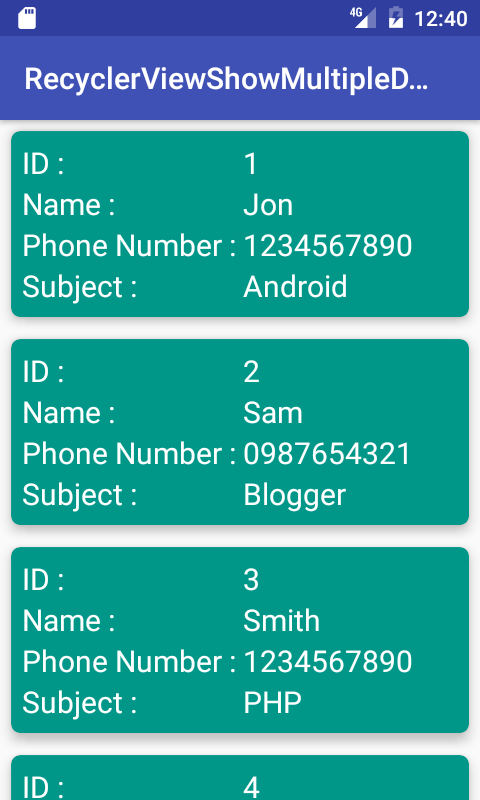 So here is the complete step by step tutorial for Android Show Multiple JSON Parsing Data inside RecyclerView. Watch the live demo video. Create database on your server including table. Create PHP Script to convert MySQL data into JSON form. Run the PHP Script to see JSON output on web browser. Start a new android application development project. Import RecyclerView, CardView and Volley library. Add internet permission to your project. //Define your database username here. 5. Start a new android application development project. 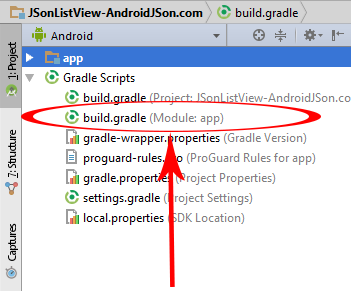 Open your projects build.gradle(Module:app) file. 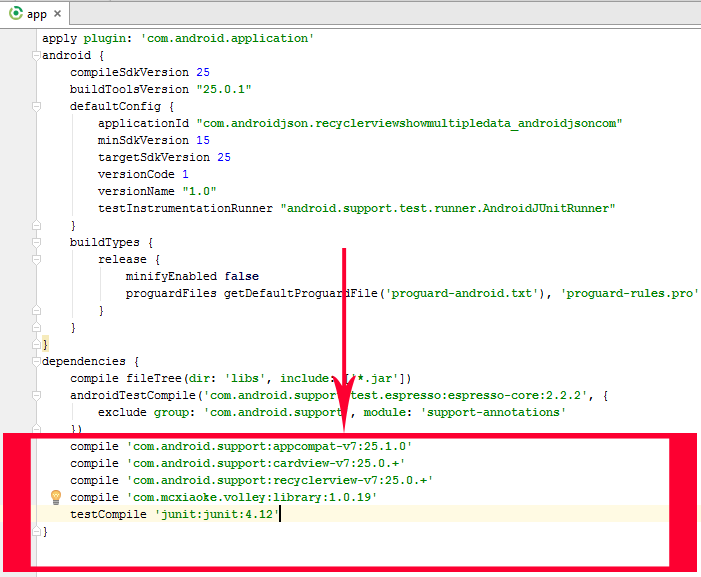 Add compile ‘com.android.support:cardview-v7:25.0.+’ , compile ‘com.android.support:recyclerview-v7:25.0.+’ and compile ‘com.mcxiaoke.volley:library:1.0.19’ . Open your AndroidManifest.xml file and write below code. // JSON data web call function call from here. //RecyclerView Item click listener code starts from here. //Getting RecyclerView Clicked item value. //Printing RecyclerView Clicked item clicked value using Toast Message. //Adding subject name here to show on click event. * Created by Juned on 2/6/2017. Code for cardview.xml layout file. Thanks Helder for your suggestion. I also have a question, if i have more than 4 variables in my table, can i just list 3-4 of them on my recycleview without having any problems? Yes sure just only add 3-4 into your adapter on parsing time . For example i am adding name using GetDataAdapter2.setName(json.getString(“name”)); instead you can add anything into your adapter as you require.